Embellishing Techniques: Adding sparkle, texture and interest to ready made clothes. Zip Techniques: How to insert different types, lapped, centred, Invisible/ concealed etc..
Sewing Machine Basics: Get the most out of your Sewing machine, all of the stitches, the feet & the different types of needles. 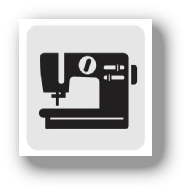 Get the most out of your Overlocker / Serger: Take the fear out of your Overlocker and learn all it’s capabilities. From Finishing to Rolled Hem. Learn to Love Your Coverstitch Machine: Achieve a Professional Finish to your garments and learn all that it can do. Knitting Machine Know How - Specialising in Brother & Passap / Pfaff . Cushions: Basic Fold over with toggle, Fold over with buttonholes, Zipped, Piped, appliqued. Doll Making: Cloth Dolls from Raggedy, Tilda style to Art dolls. Doll clothes: Fun for Grandmothers as doll clothes make great gifts too. From 11 ½” fashion doll (Barbie & Cindy) size to Blythe & Baby dolls. ‘Sewciable’: A Fun Sociable sewing group to share and polish your skills.